Triathlon Warrior - Critical Speed Camp. May 18-21, 2018. Hosted by two of Canada's most experienced endurance athletes and multi-sport coaches, Cal Zaryski and Kevin Cutjar, this 4 Day Spring Training Camp, will suit cyclists and triathletes of all levels. LAST MINUTE SPOTS AVAILABLE !!! See Camp details below. Open Water swim sessions in Tuc-el-nuit Lake include open water skills, race prep and strategies and structured, patrolled workouts. Cycling Focus, with a late spring in Western Canada this year. This camp hosts supported rides for groups of all levels, to build on winter training and provides in your cycling fitness, before your race season really gets under way. Triathlon Specific information and training sessions, such as nutrition and race strategy advice, transition area set-up and training, runs-off the bike, mental preparation and general Q&A with the coaches. Timed perfectly for your early season triathlons in Western Canada. 2-3hours - Routes determined pre-ride. 4pm - BOWMONT - RUN Out-&-back group run. 7pm - WELCOME NIGHT - Dinner & Coach info session. LaCasa Ouzeria - 1090 Main Street Penticton. PALACE ROOM - Greek/Italian Cuisine. GF options available. *5km from the Peach on Lakeshore Drive. Register online & print your personal bar-code and bring it to the start/finish line. + RUN - Off the bike option. 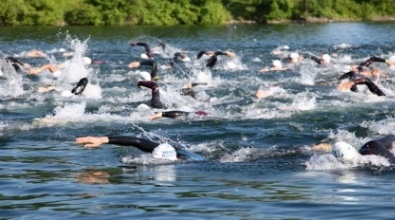 Skills and aerobic swim + Transition Set-up and race demos. 8.30am - BOWMONT - Endurance RUN. 9.00-11am - BOWMONT - Continental Breakfast Buffet. 10am - BOWMONT - Cycling only group ride leaves. 11.30am - BOWMONT - Recovery ride leaves - short, flat, easy spin. Open Water swim session & Transition Practice. Coach Q&A. 7pm - PUB NIGHT - KVS PUB @ Ramada. 1050 Eckhardt Ave W.
8am - BOWMONT - BIKE - Recovery ride or pile on the miles. Accommodation is available at the Bowmont Hotel. Ph 250 490 0231. Nearby options include The Days Inn, Sandman Penticton, Ramada, Casa Grande Inn, Shoreline, Penticton Lakeside Resort. Contact us if you have any issues - we may be able to assist in last minute accom!! Camp includes all supported workouts, coaching and info sessions, Welcome night dinner, Sunday brunch and souvenir garment. Price includes online registration fees. 5% GST is applicable. REGISTRATION CLOSES MIDNIGHT, Monday May 13th, 2018. The 2108 Triathlon Warrior Critical Speed Camp Refund Policy - 75% of the paid registration fee is refundable for cancellations up until midnight April 30th, 2018. For cancellations between May 1st and May 18th, 50% of the camp fee may be used toward another service* during 2018.